Game of Thrones actress Sophie Turner first took to our screens as Sansa Stark in 2011. Since her debut she has been a fashion force to be reckoned with, covering Marie Claire, Nylon and many more major magazines. 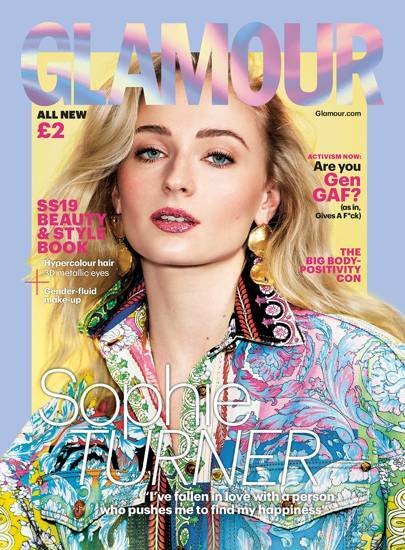 This month Glamour have announced Turner will join her GOT co-star Maisie Williams as the cover stars of their SS19 Beauty & Style Book. Nevertheless, I have chosen a more appropriate outfit to bag for less. This look takes inspiration from one of her ‘out out’ looks in Los Angeles with soon to be sister-in-law Priyanka Chopra. 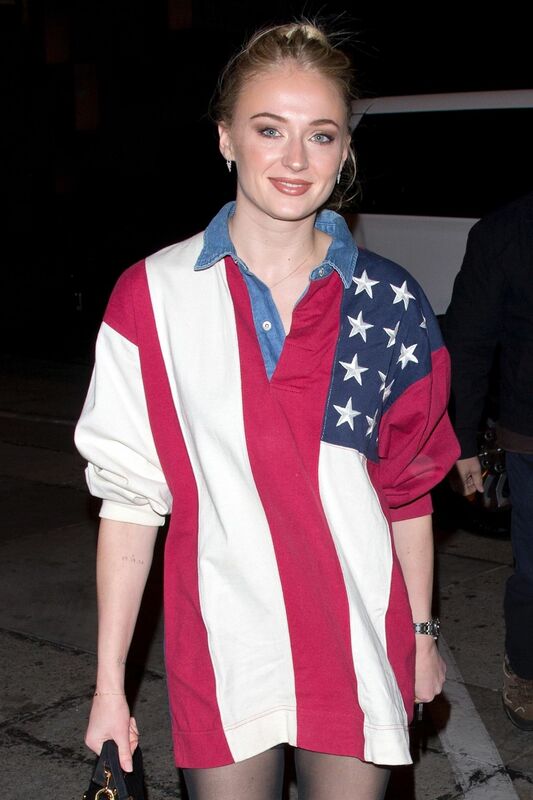 Wearing vintage Tommy Hilfiger, this Brit rocks an oversized American flag shirt dress. 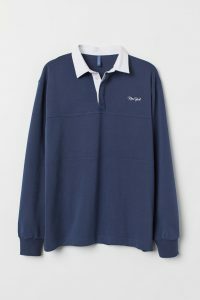 Pick up a similar style from H&M’s menswear section (€19.99). 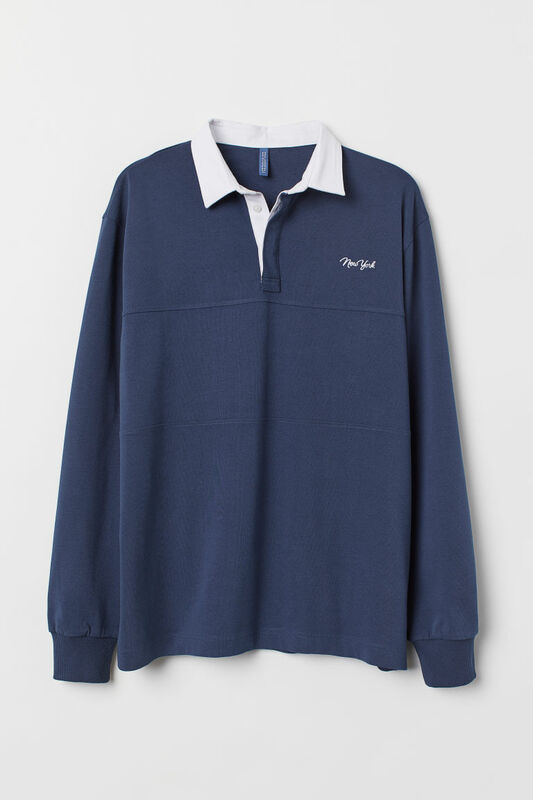 This navy ‘New York’ rugby shirt will work as a dress if you size up to either XL or XXL. If you can splash the cash for the real deal, keep an eye out on Etsy, prices vary from €27.30 to €227.54. Of course, read the reviews before making an order and remember if it seems too good to be true, it might be! As a Louis Vuitton brand ambassador, Turner makes the obvious choice and styles the shirt dress with LV accessories. The Nasty Gal ‘Good Run Treaded Sneakers’ are a close second to the Louis Vuitton ones worn. The site always has incredible deals, typically 40-50% off. At the minute these trainers are available for €23.50, reduced from €47. 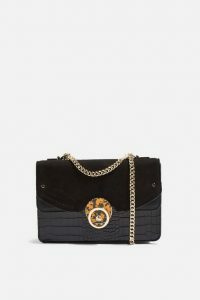 This adorable Topshop bag is a great dupe for the Louis Vuitton ‘New Wave’ bag, which retails for €1490. On a student budget, the €40 Topshop bag will do just fine! As for final touches, add some simple accessories like Weekday’s silver mini hoop earrings (€6.91 available from ASOS) and low denier tights from Penneys (pack of for €6). Sophie Turner has a classic English rose complexion and uses makeup to play into this look, keeping it simple and elegant. Taupe eyeshadow and a soft peach blush seem to be her go-to products. The ZOEVA ‘En Taupe’ palette is a brilliant buy (€21.75, Beauty Bay). The ‘Life’s a Peach’ blush by L’Oreal is very like the one worn by the natural beauty (€11.99, Boots). In a recent interview with Glamour, Turner revealed her favourite hair care products were by the brand Wella. She adores the Wellapex No.3 Hair Stabilizer (€19.28, parfumdreams.IE). Seeing as Sansa’s fiery red locks are very different to Turner’s naturally blonde ‘do, I trust any haircare recommendations coming from the actress. Her hair has been dyed again and again. In her spare time, Turner can be found chilling with her fiancé Joe Jonas and the rest of the Jonas Brothers clan. She stars in the music video for the band’s comeback single ‘Sucker’, alongside Danielle Jonas and Priyanka Chopra. With assignments stacking up and exams looming, now is the perfect time to procrastinate and take a Buzzfeed quiz. ‘Are You a Sophie, Priyanka or Danielle?’ is basically a backwards way to find out which Jobro your younger self is destined to be with. Finally we will have answers! Without a doubt, binge-watching Game of Thrones is highly recommended – if you somehow haven’t seen the series by now. With its return date set for 14 April we couldn’t be more excited to see the Starks fight for the Iron Throne. While the world waits for the final season, watch Turner’s blockbuster X-Men: Apocalypse and her Carpool Karaoke episode alongside Maisie Williams on Apple Music. But fret not; April is just around the corner.